Have you considered taking your business to the next level but you're unsure where to begin? Please join us as Gains Through Giving San Diego host the outstanding CEO Michael Mushlin of 'The Unstuck Entrepreneur.' A tremendous number of businesses have had major turnarounds with the professional experience of The Unstuck Entrepreneur. He delivers Clarity and Results and will show you how to get your first paying customer in 45 days! If you want to learn how to be a Business Owner vs. An Entrepreneur then the insights, wisdom, and knowledge are what you need to get from Dr. Stephen Kalaluhi CEO and founder of Stephen K Leadership! If you're discouraged, unmotivated or need some perspective insight you don't want to miss this talk from Mr. Juan Hidalgo as he speaks on his astounding leadership career. Not only did he reach the highest rank in the United States Marine Core, but he ran for the 51st Congressional district for Congress, he's an outstanding husband and father, he's heavily involved in his church and the community, he's now working as the executive director for a veteran non-profit, and lastly he is again a candidate for the 51st Congressional district. The Gains Through Giving community was totally blessed to learn from such an amazing Marketplace Influencer! As founder of LifeOnFire.com Nick has coached over 2,551 people on how to get clear on what they want and to achieve their wildest dreams. His unique ability is to clearly teach simple strategies that he calls “mindset hacks” that will help you unlock your true potential and live your life to the fullest. He calls that living your life on fire! ? He's coached everyone from entrepreneurs, sales professionals, executives, service professionals, and stay at home moms to achieve their dreams. We know you will be impacted by everything Nick has to offer! We hope you enjoy this recap video and that it also pushes you to partner as a GTG Member (Enjoy Exclusive Life On Fire Pricing) or that you reach out to Nick and the Life On Fire Movement directly. Click Here For The Full Recording! 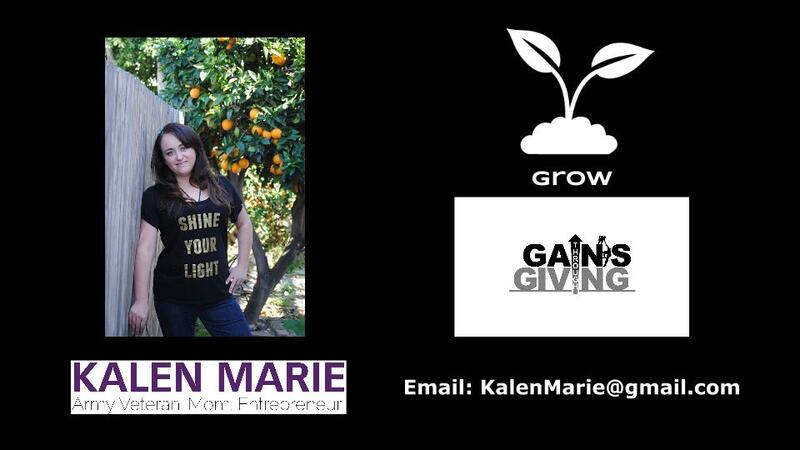 Kalen Arreola helps small businesses get more clients. She shows small business owners that marketing and promoting their business can be crazy fun, and doing it with a coach will bring you miles ahead of others! Gains Through Giving - We apologies that the recording of this event wasn't captured. Unfortunately recording cut off halfway through. Bummer. We did however upload Kalen's slides for you to review! Enjoy! The True Challenge™ is dedicated to seeing the success of their clients by holding up a high standard of quality, integrity and care into everything we offer. The TC crew is focused, driven, and committed to our community of entrepreneurs. We are driven to see your physical, financial, and personal life become the success story you desire. Amanda and Nick now run The Billion Dollar Body! Kevin Lochner is a man on a mission to help others mission is to develop enduring relationships with clients by providing expert guidance for a lifetime of financial security. Kevin works with clients to identify their financial security needs and then focus on solutions that can help make those financial goals a reality. Finding right solutions for personal, family or business needs. For additional information, connect with him on LinkedIn. Dr. Matt Hubbard is a living, breathing billboard for the Wellness Lifestyle. Steeped in fifteen years of clinical practice and the day to day teaching and application of wellness principles, Hubbard’s interface with a vibrant family practice affords him a unique perspective of what works in healthcare – and what doesn’t. Tim Mulcahy is one of the leading direct marketing entrepreneurs in North America. 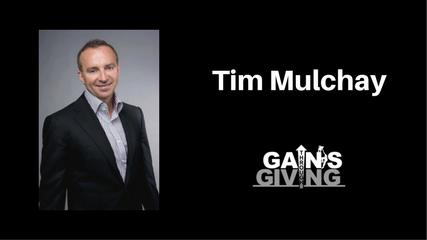 A rags-to-riches story, Tim has helped develop many salespeople into millionaires. His successful career in direct marketing and the development of motivational programs spans over 30 years. He has graciously given the Gains Through Giving Mastermind his best sales training material! Tim co-founded Ontario Energy Savings Corporation, developed the sales training and motivation program and played a significant role in organizing and growing the company from a start-up in 1997 to a TSX publicly-listed company, Energy Savings Income Fund, with a current market capitalization of approximately $1.5 billion. This is a company that grew mainly from its outstanding and record-breaking success in direct and door-to-door sales. LinkedIn. Brad McCrory has over 10 years of corporate experience where he dominated in his area of expertise. With his understanding of business Brad has always stayed ahead of the curve. He is currently the CEO and owner of Commerce Acceleration! There he and his team focus on website development, commerce marketing, and mobile commerce to help raise bottom line profits for their customers in today's fast passed ever changing market. Brad's referral based business has skyrocketed his success and was the focus of this Marketplace Mentor Event! He practices what he preaches and executes the strategies he will be sharing for his own success. This event gave exact strategies Brad has used in his own success to develop grow and continue to grow New Business month after month year after year.